You may have heard of Madison County's covered bridges from the 1995 film The Bridges of Madison County, starring Clint Eastwood and Meryl Streep, adapted from the bestselling novel by Robert James Waller. In the story, the bridges provide the backdrop to a passionate illicit affair between a National Geographic photographer - Eastwood - on a working visit to capture the bridges, and a local, unfulfilled housewife - Streep - whose family are conveniently out of town for the week. But in reality, the historical covered bridges of the county in Iowa tell a story of their own. Twenty bridges were built across the county throughout the late 19th century to accommodate pedestrian, livestock and vehicle crossing. The bridges were generally built using southern pine (Pinus palustris) and northern white pine (Pinus strobus), with securing oak (Quercus robur) treenails. They were covered to preserve the flooring timbers and trusses - in a time before treated timber - which would be far more expensive to replace than the lumber used for the sides and roof; a practical feature that also gives the bridges their distinct, pictorial quality. It is also said that the covers were painted to resemble barns and thus encourage livestock to pass. 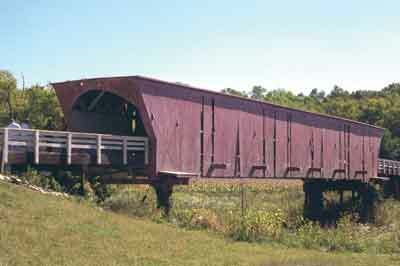 As cars and trucks got bigger and heavier, stronger steel bridges were built to replace many of the wooden covered bridges, while some of the original covered bridges were destroyed by flooding. 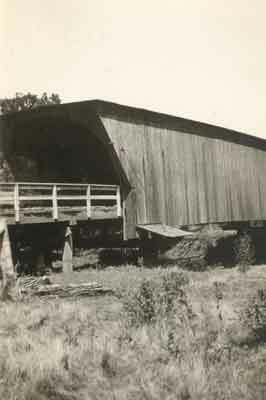 By 1933, the number of covered bridges had dropped to ten, and over the next 15 years, three more bridges were lost. 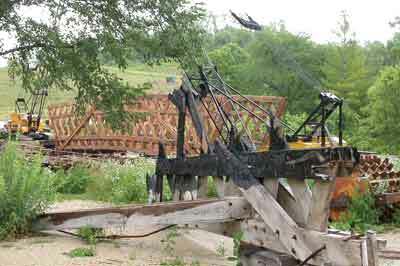 The Madison County Board of Supervisors approved funding to preserve the seven remaining bridges; they were mostly bypassed or moved to off-road locations and preserved as footbridges. The last bridge to be lost was the McBride Bridge, which was destroyed by arson in 1983 after a jilted lover attempted to burn his and his lost love's initials from the inside of the bridge. 76ft long, the original Cedar Covered Bridge was built in 1883 over Cedar Creek, north of the county seat of Winterset, which also boasts the birthplace of the toughest man to ever be named Marion, John Wayne. It is also known as the Casper Bridge, as most of the bridges were officially named after the resident who lived the closest. 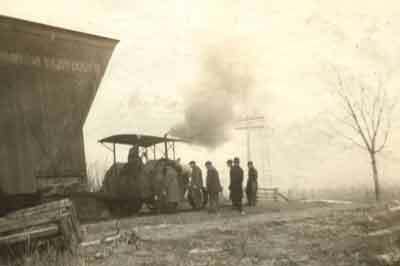 It was moved in 1921 to its current location 1.3 miles east along the Creek by steam-powered tractor. The bridge played a part in the 1992 novel as the meeting place of the main characters, and as a result became a famous tourist attraction. In 1993, Oprah Winfrey called The Bridges of Madison County her book of the year, and invited Robert James Waller and her TV crew to film her show at the bridge, where a wooden stairway now affectionately known as the 'Oprah Steps' was built beside the bridge for the filming and remains today. 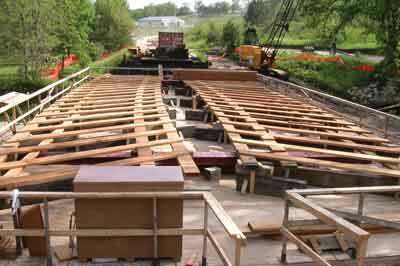 The bridge follows 'queen post' construction, meaning that each side has two uprights placed about one-third of the way from each bank, which are each connected across the top by a beam and have a diagonal brace from the bank floor to the points where the posts meet the beam. It also follows the Town truss method - patented by American architect and civil engineer Ithiel Town - whereby a lattice of small and closely placed diagonal timbers support the structure of the walls. 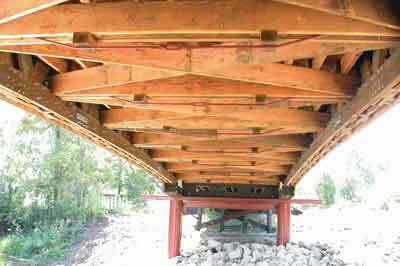 This construction allowed the bridge to be built without requiring large stone abutments or heavy main beam timbers. The Cedar Covered Bridge was renovated with painstaking attention to historical accuracy in 1998 at a cost of $128,073, but sadly the huge cost and effort invested in the restoration was effectively wasted in 2002, when the bridge was destroyed by arson. Rather than allow an act of vandalism obliterate this part of their history, the Madison County Board of Supervisors set to work to rebuild their landmark. 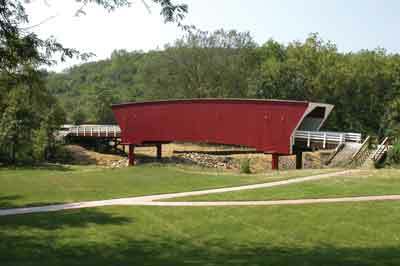 From 2003-4, a replica of the Cedar Covered Bridge was built on site, based on blueprints and photographs of the original. As the entirety of the original bridge was past the point of restoration, everything was built from scratch; new steel pilings were driven into the ground, new caissons installed and by May 2004 the under-structure was complete and the side structures were assembled on the platform. 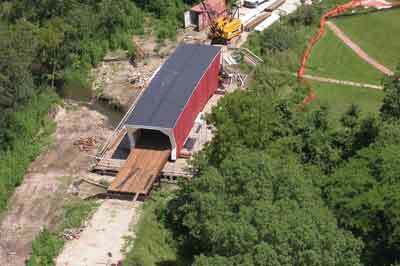 In June the side structures were completed and set in position with cross braces connecting them, and finally work on the new Cedar Covered Bridge was completed for the official opening in October 2004. All of the six remaining bridges are now monitored by remote surveillance to prevent further acts of vandalism. Another queen post construction which was also built in 1883, it is claimed that the Roseman Covered Bridge is haunted by the ghost of a criminal who was trapped in the bridge by two sheriffs' posses in 1892. Legend has it that the man made a supernatural exit straight through the roof of the bridge, howling a wild cry, never to be seen again. It too was renovated in 1992, with new steel supports for the bridge piers, although the bridge itself is still supported exclusively by its wooden truss structure. The bridge was artificially aged by Warner Brothers in 1995 to make the newly restored bridge look duller in colour, with peeling paintwork, to give an authentic look to the bridge for the film, which is set in 1965. The Holliwell Covered Bridge remains in its original spot over the Middle River, southeast of Winterset. 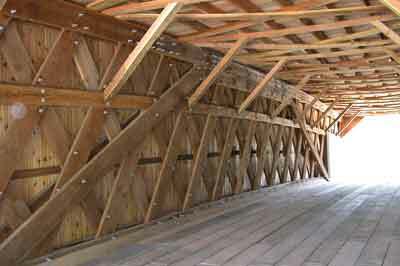 At 122ft, it is the longest of the bridges, and is unique among the Madison County bridges in that its inner construction is of the wood bow truss type, featuring a curved beam which acts as an arch. of the others are planked lengthways. While the Cedar Covered Bridge played a pivotal role in the novel The Bridges of Madison County, it was Holliwell that was used for these scenes in the film adaptation. The Imes Covered Bridge, built in 1870, is the oldest covered bridge still standing in Madison County. 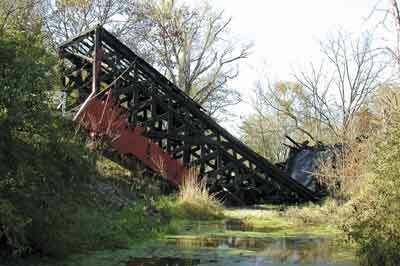 It has moved twice in its life, once in 1887 from a spot over the Middle River to Clinton Creek, and was later replaced by a concrete bridge and moved to its current location at a roadside park over a natural ravine near the city of St. Charles in 1977. Its location close to the interstate makes it the most accessible of the bridges. It is unusual in that it has a pitched roof, whereas most of the bridgesâ€™ roofs are flat. The northernmost of the remaining bridges, the Hogback Bridge still stands in its original location in which it has been since 1884, and remained open to traffic as late as 1993, when it was bypassed by a new concrete bridge. While most of the bridges were named after the closest resident, the Hogback Bridge was named after the ridge line at the west end of the valley, where two overlapping types of rock with different rates of erosion form a feature known in geology as a hogback. The Hogback Bridge was also the victim of arson in 2003, but thankfully the fire was found by tourists in time for the fire to be put out with minimal damage. 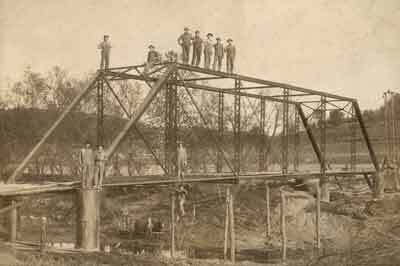 The 79ft Cutler-Donahoe Bridge - so named after two families made a claim to the bridge's naming rights - was built in 1870 by Eli Cox, and originally stood over the North River in the city of Bevington. 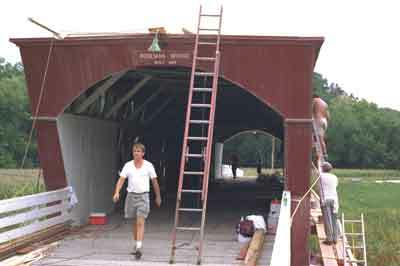 It was moved to its current site for preservation as a footbridge and entrance to Winterset County Park in 1970, in time for the first annual Covered Bridge Festival. Each year, the residents of Madison County celebrate their history on the weekend of the second full week in October with a festival which, as well as guided tours of the historic bridges, includes music, antique and craft vendors, food and historical re-enactment, commemorating the area's rich, though relatively short history since its inception in 1846. For more information visit the website.